The FlexBody library enables you to build complete mechanical models combining flexible structures and rigid bodies. Using features of the Finite Element analysis tools Nastran, Genesis or Abaqus, large, complex Finite Element models can be reduced to simpler models consisting of a small number of boundary nodes, or attachment points, and frequency modes. The reduced models are read in to Dymola and define the flexible component which can be used as part of a Modelica system model. This approach enables the dynamics of the structure to be coupled to the behaviour of the complete system. 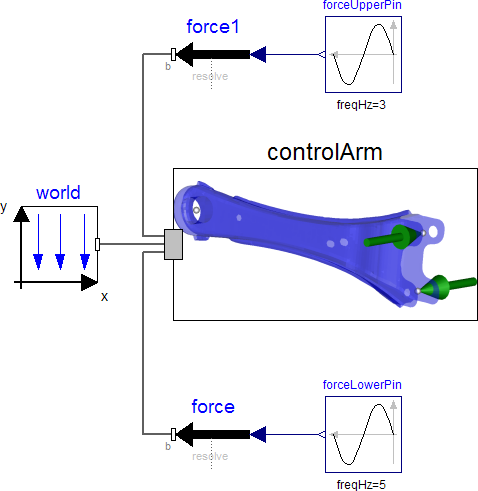 The FlexBody library uses standard Modelica MultiBody connectors so that it is compatible with other Modelica libraries. Enables the creation of complete mechanical models combining flexible structures and rigid bodies. Standard Finite Element analysis methods and tools are used to reduce the FE models and define flexible bodies for use in Dymola. Reads the standard output files produced by Nastran, Genesis and Abaqus. Nastran, Genesis and Abaqus include methods for model reduction known as Component Mode Synthesis or Craig-Bampton reduction. These transform the detailed Finite Element models in to more efficient representations for use in dynamics. This transformation reduces the models from 100,000’s degrees of freedom to a much smaller number of degrees of freedom at defined boundary nodes, or attachment points, and a number of frequency modes of the structure. The reduced models are defined by the Finite Element tools to represent small displacements of the boundary nodes. To capture the true dynamics of the body the deflections of the structure are super-imposed on the motion of a floating rigid reference frame that captures the large displacements and rigid body modes of the structure. The reduced models are then read in to Dymola using the FlexBody library. 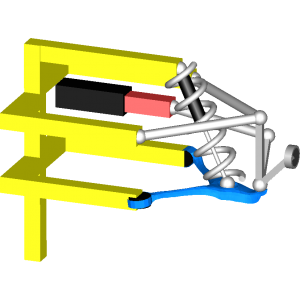 This then defines a flexible component which can be used as part of a Modelica system model and is compatible with the MultiBody library in the Modelica Standard Library. This approach enables the dynamics of the structure to be coupled to the behaviour of the complete system. The typical application areas for the FlexBody library include robotic arms, large machines such as excavators and cranes, and automotive components like suspension arms, brakes and folding roof mechanisms. The library is useful in any situation where the response of the structure has a significant impact on the overall system dynamics. The library has been written to be compatible with the Modelica MultiBody library which is used as the basis for all other MultiBody applications such as VeSyMA – Suspensions. The model on the right uses a FlexBody component to model the lower control arm in the double wishbone suspension. 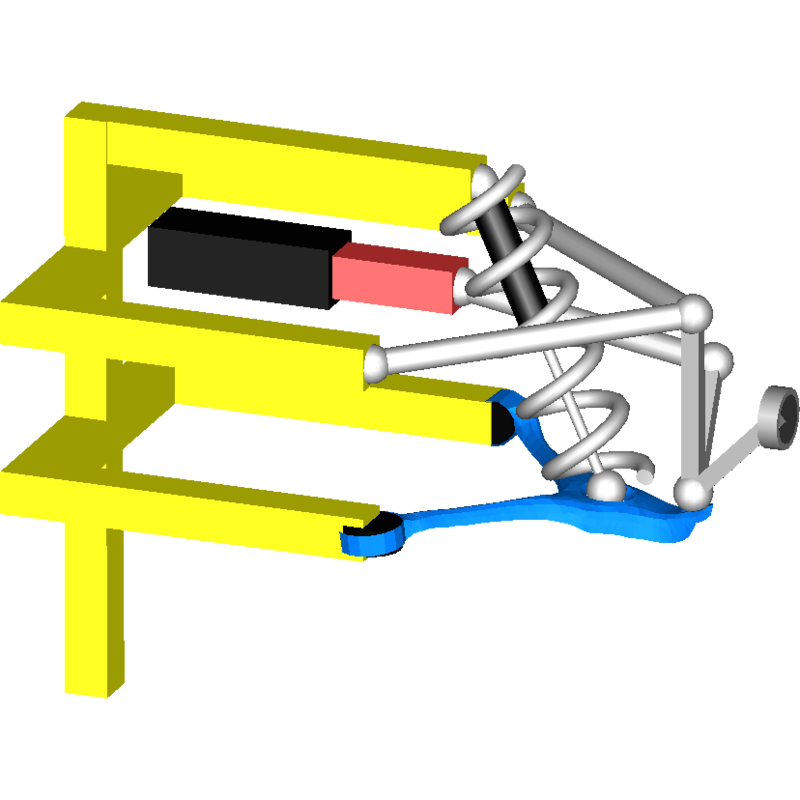 The suspension is then placed in a kinematics and compliance (KnC) test rig and the forces (red) and torques (green) acting at the wheel centre are applied. In this case measured road load data is applied to the wheel hub and the response of the suspension can be assessed. By including the structural compliance in the control arms the effect on the toe and camber angles and the reactions in to the vehicle body can be assessed. 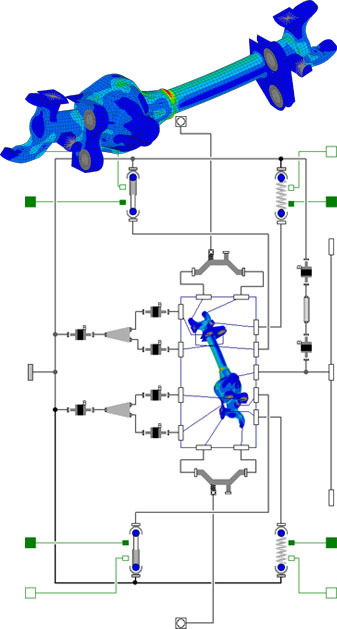 In addition the load cases for further finite element analysis (FEA) can be determined and the targets for the stiffness of the control arms can be refined.